The famous Marvel comic superhero group battles the evil artificial intelligence robot Ultron in Marvel’s The Avengers: Age of Ultron – a greatly satisfying film filled with many amazing moments. Chris Evans (Captain America), Chris Hemsworth (Thor), Robert Downey Jr. (Iron Man), Mark Ruffalo (The Hulk), Scarlett Johansson (Black Widow) and Jeremy Renner (Hawkeye) provide the primary hero roles. Other returning characters include Samuel L. Jackson as Nick Fury, Don Cheadle as War Machine, Anthony Mackie as Falcon, Stellan Skarsgard as the Thor’s ally scientist Selvig; Paul Bettany as Stark Industry’s managing computer voice Jarvis and Cobie Smulders as S.H.I.E.L.D. agent Maria Hill. Other characters do not appear in this group installment and instead are regulated to the individual hero franchises. Audiences even get some romantic development between two characters that seems genuine and logical though maybe a bit accelerated unless the passage of time between the two Avengers films is considered. Elements from the separate superhero films blend as well as the special effects, so audiences never get the sense that the franchise is stagnate or everyone is assembled only to boost their popularity. Stan Lee also gets his now standard cameo. The quick dialogue gets even sharper among this group led by Captain America plus audiences get to see more personal sides and revelations within the team. Aaron Taylor-Johnson and Elizabeth Olsen (Godzilla) reteam as the brother and sister twins Pietro and Wanda Maximoff (a.k.a. Quicksilver and Scarlet Witch). Andy Serkis exhibits his amazing screen presence as another new character named Ulysses Klaue. Filmmakers concentrate on the huge action sequences and character plotlines including new revelations about S.H.I.E.L.D., which plays a notable, but less significant role here. 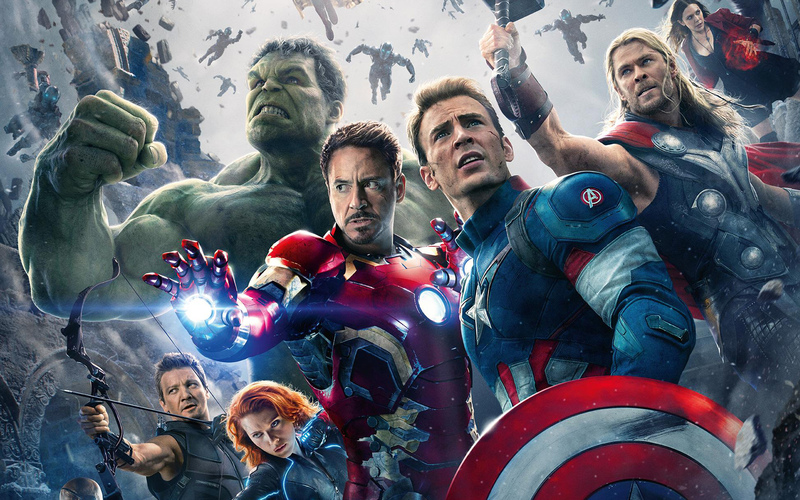 The main plot concerns the internal development of the Avengers team and the personal journeys of each member. Director/producer/co-story writer Joss Whedon forges the well-integrated special effects, quick fire humor/references, and amazing action into one big event that demands multiple viewings. Audiences enjoy a wide scale where they genuinely feel the heroes are in danger, but also feel how they assert and refine their powers. Ultron, well voiced by James Spader (TV’s The Blacklist), represents the worst in artificial intelligence, which shouldn’t be a surprise considering results from previous films (e.g. the Terminator film series, etc.). Avengers: Age of Ultron was filmed in several worldwide locations including South Korea, England, and Bangladesh. Watch before the text ending credits for one special short sequence. Will Spider-Man and Wolverine eventually join the group?…hopefully so, but the group is evolving well. This highly recommended two-hour and 21-minute film (***1/2) delivers and is rated PG-13 for intense sequences of sci-fi action, mild language, violence and destruction and for some suggestive comments. This entry was posted in 2010s Film Reviews, Film Reviews and tagged Avengers, Film, Marvel, Michael Siebenaler, Mike Siebenaler, Tall Writer, Ultron. Bookmark the permalink.